2) Fill out the Job Application Form with your information. 3) Once you’ve filled out the form, please save it to your computer and email the application to info@tahoedaves.com. 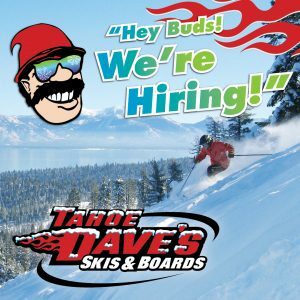 Tahoe Dave’s Skis & Boards in North Lake Tahoe has full​-​time and part-​time openings available for the remaining 2019 winter season. Tahoe Dave’s offers competitive benefits that include employee discounts on equipment/gear and additional benefits such as health insurance contributions to eligible employees. Retail Associate and/or Rental Technician positions are currently available at our Tahoe City and Kings Beach location. Must be dependable, trustworthy and team-oriented with exceptional people skills and great customer service. Previous ski and snowboard knowledge/experience is preferred but not required. Must be able to work weekends and holidays. Questions? Call us at (530) 583-6415.